Submitted by kalikan on March 10, 2015 – 9:10am. His recipe produces 3 breads/boules/loafs. After splitting the dough in 3 equal parts (using scales), my end result was 3 rather small breads. I’m sure someone here baked these breads before, are end results suppose to be this small? Now, I know I probably overproofed a bit (and lost some oven spring) – it’s much hotter in house (it was probably around 75 in the kitchen when I started and probably close to 80 by the time bread went into the over), and as I originally planned on the timeline provided in the book, I just couldn’t get oven hot enough in time. 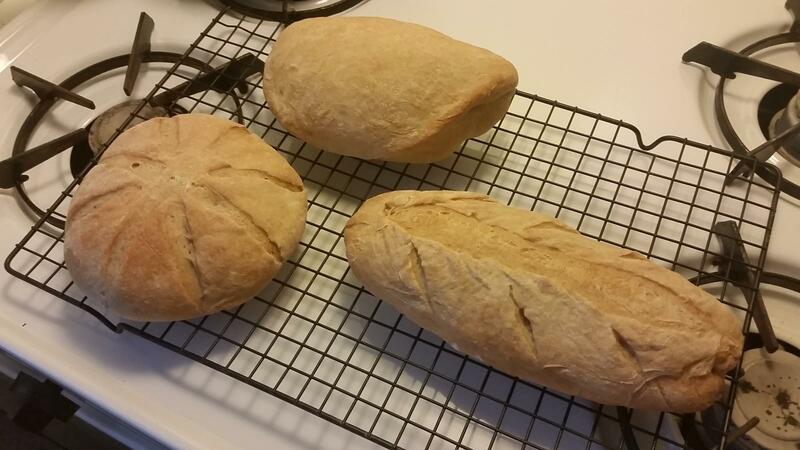 Still, the finished breads appear to be too small to me (maybe next time I’ll just do two or even one boule instead). Is this the case of not enough temperature or was this because dough was to some extend overproofed by the time it went into the oven? Bread tastes just fine to me, though my wife said she taste was a bit yeast-ish to her. Crumb is dense, but my understanding is that this is how it suppose to be in this type of a bread… Just trying to see where and what I did wrong, planning to tackle this bread this weekend again and hopefully get to something I could be satisfied with.